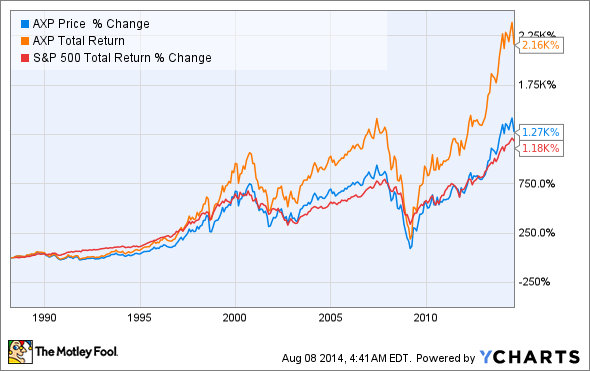 It's August already, but it's never too late to invest -- and the best dividend stocks for 2014 are timeless. 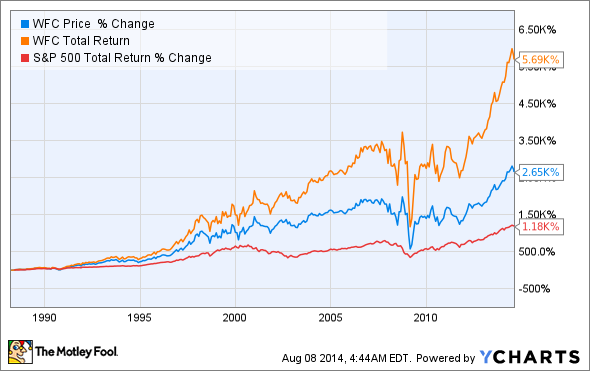 It's August, and you're still searching for the best dividend stocks of 2014. You might even feel bad that you've been sitting on the sidelines, waiting for the right time to invest. It's fine. Really. After all, it's never too late to start looking for great stocks that you can buy and hold for years to come. So let's take a closer look at a few fantastic companies that pay nice dividends, have track records of increasing payouts, and, most importantly, are well-positioned to reward investors for many years to come. Wells Fargo Bank (NYSE:WFC) and American Express (NYSE:AXP) are two of the Oracle of Omaha's favorites. Respectively, they are the biggest and third-biggest holdings of Buffett's conglomerate, Berkshire Hathaway, and together, they account for one-third of Berkshire's portfolio. You may be looking at your computer screen askance right now. After all, you came looking for advice about dividend stocks, and the first two on my list only pay yields of 2.8% and 0.85%! What gives? Don't worry -- there's a method to this madness. These two companies rarely show up in "Best Dividend Stock of 2014" rankings, but if you can accept the meager income they offer today, then your patience will be rewarded. Nearly half of American Express' total return owes to a modest dividend that simply gets increased regularly and paid out consistently. Why would a dividend seeker consider American Express today? In short, the growth potential is enormous. Did you know that something like 90% of global commerce transactions are still done in cash? Even with the amazing advances in technology and the increasing interconnectedness of the world, the vast majority of people are still using cash. As the world economy develops, American Express is incredibly well-positioned for the same kind of growth it experienced in the U.S and Europe over the past 40 years. If you plan to reinvest your dividends, rather than live on them, American Express deserves a long, hard look. As with American Express, a significant portion of Wells Fargo's returns over the past 30 years owes to the dividend. While you may have reserves about investing in a megabank, Wells is an exceptionally well-run organization. Case in point: Wells Fargo and JPMorgan Chase, unlike Bank of America, CitiGroup, and US Bancorp, pay higher dividends today than they did before the recession. True, Wells reduced its dividend during the recession, but it consistently offered some yield, whereas its counterparts cut payouts to a nickel per share or less. What enabled Wells Fargo to keep those dividend checks coming? Conservative management of the bank's balance sheet even during the heights of the housing explosion. Wells Fargo's management has kept the company focused on its strengths in consumer and commercial lending, rather than investment banking activities. And while this might limit the bank's upside potential, it also reduces the risk of permanent losses. 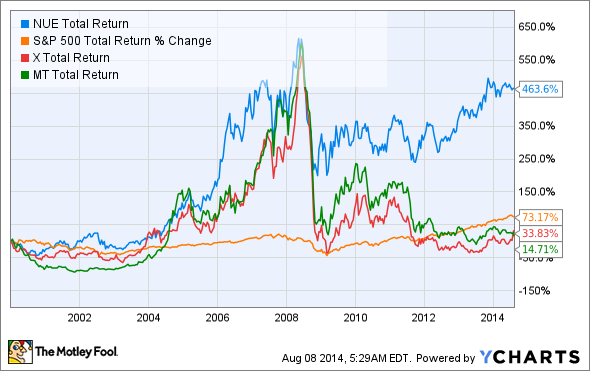 Nucor (NYSE:NUE) is, simply put, the best steelmaker in the world to invest in. It pays a yield just under 3% and is the only steelmaker that makes money in nearly every market condition. 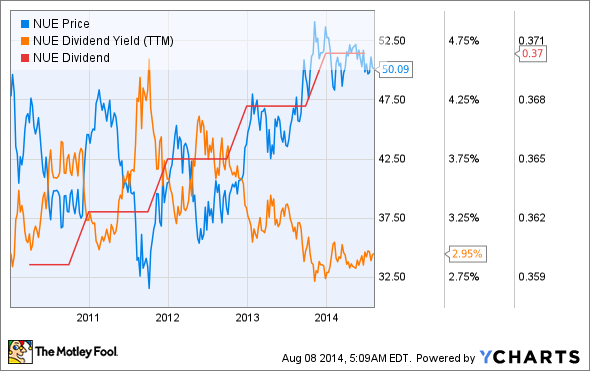 So why isn't the stock's yield higher? 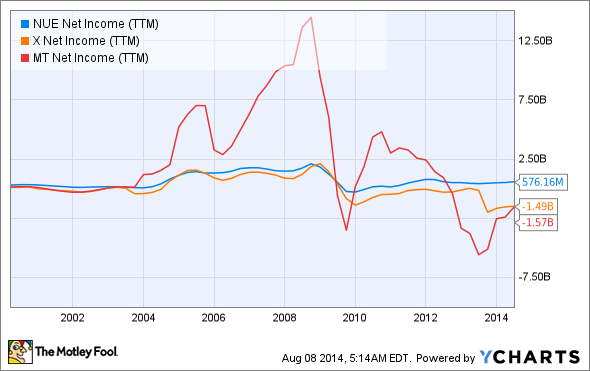 NUE Net Income (TTM) data by YCharts. NUE Total Return Price data by YCharts. If you're looking for maximum yield today, these may not be the best stocks for you. But if you're looking for investments to hold for the long term and the dividend is part of your income strategy years down the road, then all three of these companies deserve a closer look.